If you’re planning on selling your home, it’s especially important that you keep it in tip-top shape and stay up to speed with new, popular home trends. You may even attract new home buyers! Here are some of the top home remodeling trends in 2015, according to remodeling experts – Andy Lindus of Lindus Construction, Mike Blank of MBC Remodeling, and Jason Hampel of Moss Building & Design. 1. Bye-bye ceramic flooring…Hello luxury vinyl tile. Increasingly in 2015, home owners will be using luxury vinyl tiles on their kitchen or bathroom floors instead of ceramic. This type of flooring gives a higher end look at a cheaper price. 2. More painted kitchen cabinets and less stainless steel. You’ll begin to see more painted cabinets in new kitchens along with white trim this year. People are also starting to move away from stainless steel appliances because they show fingerprints very easily. It may be hard to believe, but granite countertops are on their way out. Although not gone completely, we will start seeing a much greater demand for high-end kitchen countertops that require little maintenance, such as soapstone, engineered stone, or zinc. In the bathrooms of new trending homes, buyers are leaning more and more toward cooler colors on the wall and décor. 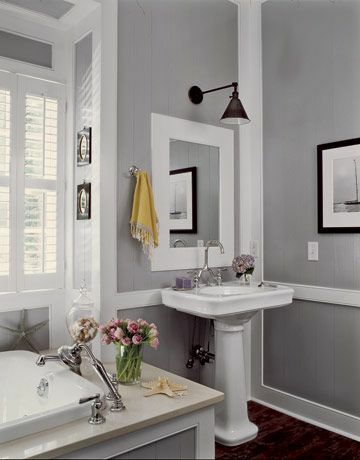 Specifically, cool grays, green, blues and white will be popping up in remodeled bathrooms. 5. Adding a “keeping room” off the kitchen. An increasing number of residents are adding “keeping rooms” to their home’s layout. A somewhat small room located near the kitchen, it’s a great place where kids can play with their toys, or the room can even be a study or media room. 6. Bigger closets and bathrooms. Another home design trend that you’ll see in 2015 is in the bedroom. Less money is being put into bedroom space. Rather, there is a higher demand for larger closets and bathrooms because people want to make better use of their space. Now is the perfect time to think about redecorating your house to attract new home buyers in 2015. Just follow these top home design trends. You’ll be glad you did!